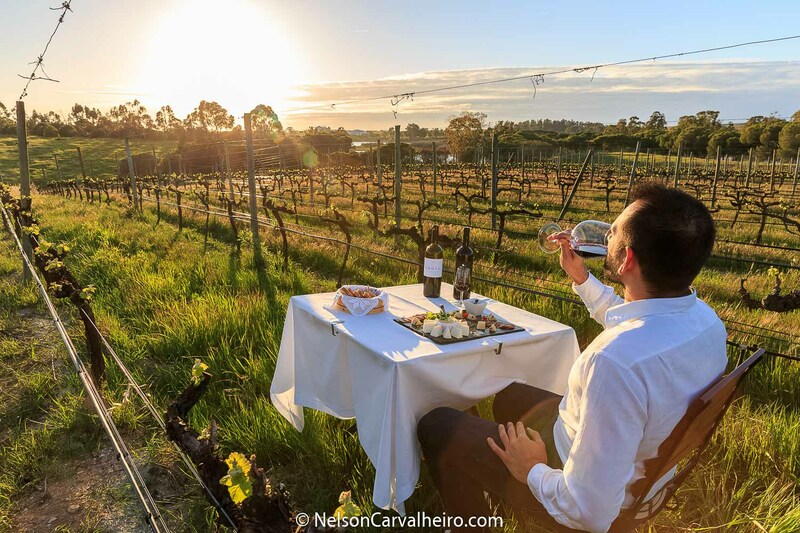 We have been publishing sections of Nelson Carvalheiro's Alentejo Wine Travel Guide where he shares his thoughts and expert advice from this Alentejo experience organized by Wine Tourism in Portugal - the main wine tourism booking portal in Portugal. 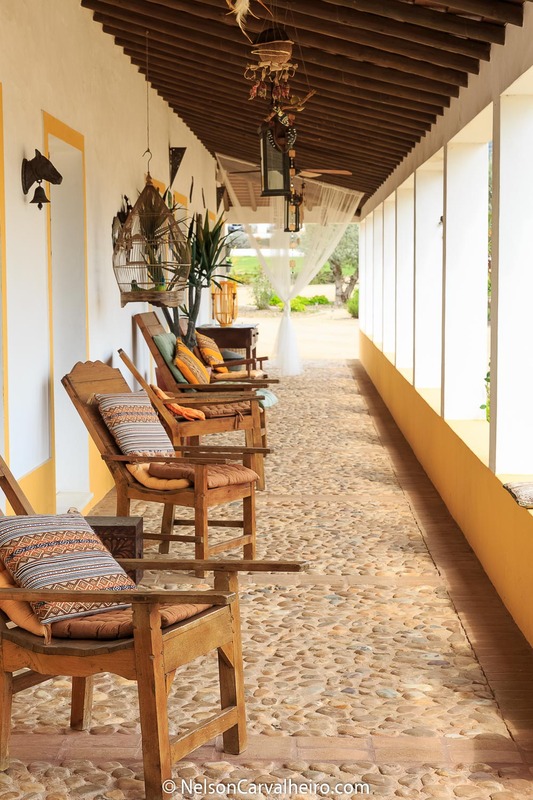 This last part focus on the best food and wine experiences Alentejo has to offer. Filled with excellent recommendations of great wines and delicious foods, this is a guide you absolutely can't miss. Instead following a recipe, the Alentejo has its own way of doing wine. A slow and very personal way, one that is distinct from producer to producer, adding that extra layer of unique personality to the Wines of Alentejo, which so many other international wines fundamentally lack. And it is here that the Alentejo wines and its territory defines itself: people who love their land, chubby, rounded figures, who live by the rule of bold, deep and meaningful flavors, who only eat from local restaurants, regional cuisine, and who seek to transmit as much of this Alentejo and Portugal feel into its wines. You see the solitude of the long planes of the Alentejo territory, the relative distance to the capital makes it an isolated part of Portugal, and this isolation leaves time for people to think about their life, during the waiting periods, or during the long drives from place to place. There is no need to constantly fill your life with something, there is no want to feel the “buzz” around you. It is a place for peace, for quietness and reflection, and this is translated into the wines. There is patience, virtue, time. In the Alentejo wines, nothing is rushed, everything takes its time. There is time to breath. Its natural! They have time to seek, to experiment to enjoy. A vintage past which is very present in everyday life. They look at things in a different manner, there is respect for the way life is, no one is trying to rush it. And of course, like in the way that the wine maker’s life their life, this wine also establishes a deep and meaningful relation with you when its drank. Its aroma and flavors liger around in the palate making you experience several levels and layers of character. These are wife wines, not one-night stand wines. 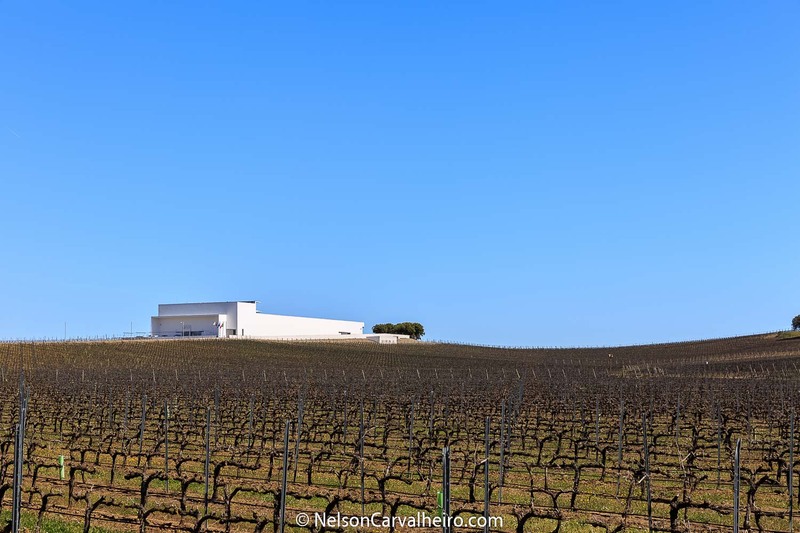 What is especially nice about wine travelling in the Alentejo is that all the crowds are in Napa, Bordeaux, Tuscany and Rioja, not in the Alentejo and this is worth GOLD! I arrived to Herdade dos Grous around 18h00 in the afternoon, after my visit to Herdade do Esporão. 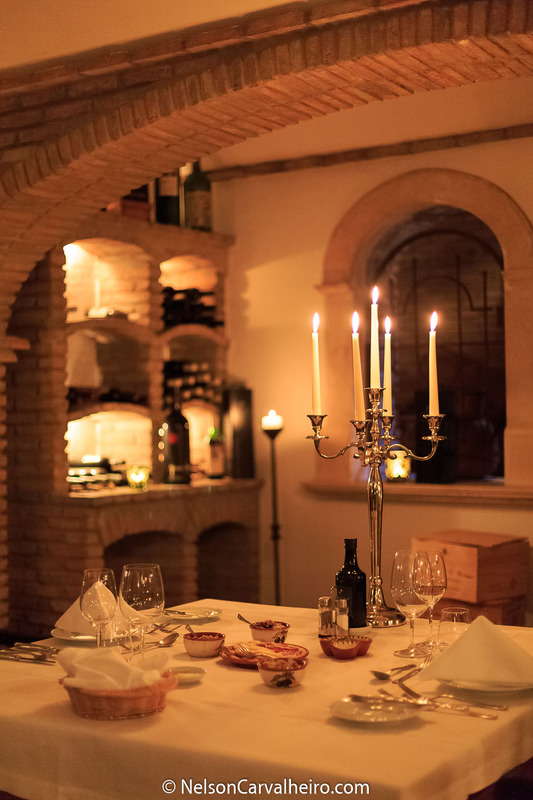 As with the last two evenings, Wine Tourism in Portugal had set me up with Chef Rui Prado, for a Chef’s Night at the estate’s private wine cellar. I had been thinking that this was the end of day three of my journey, and I was still missing the cover photo for this Alentejo Wine Travel Guide. Taking a look around the main building of the Herdade dos Grous, one can instantly notice that this is one of the most beautiful and well looked after wine estates in the Alentejo. Everything was clean, there is a little garden, flowers and even a view to the estates private (and enormous) lake. This was it, I had found the place for my opening photo of this article, now I just needed to decorate it. 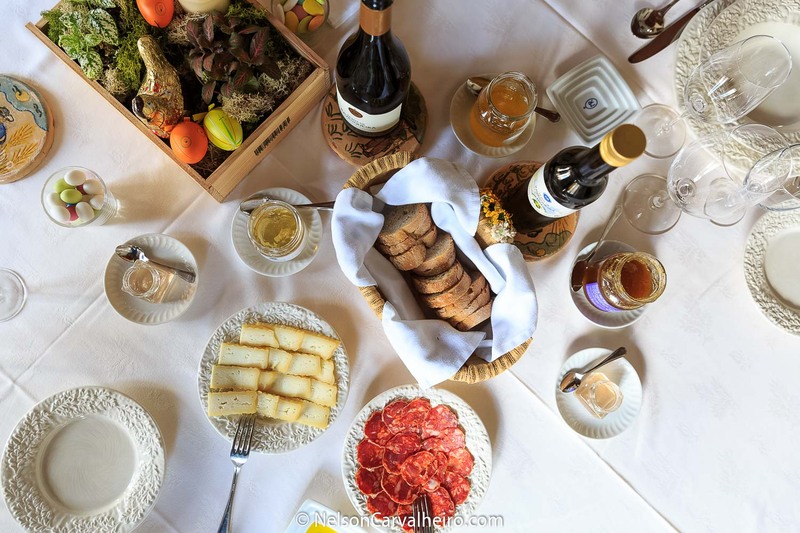 From my experience within the last three days, it became increasingly clear that food is an integral part of the Alentejo, when one defines it was a Wine Tourism Destination. It impossible to come her just for the wholesome wines, they have to he enjoyed (not just tasted) with food. This what the locals do, it is part of their culture, and who are we to say otherwise. 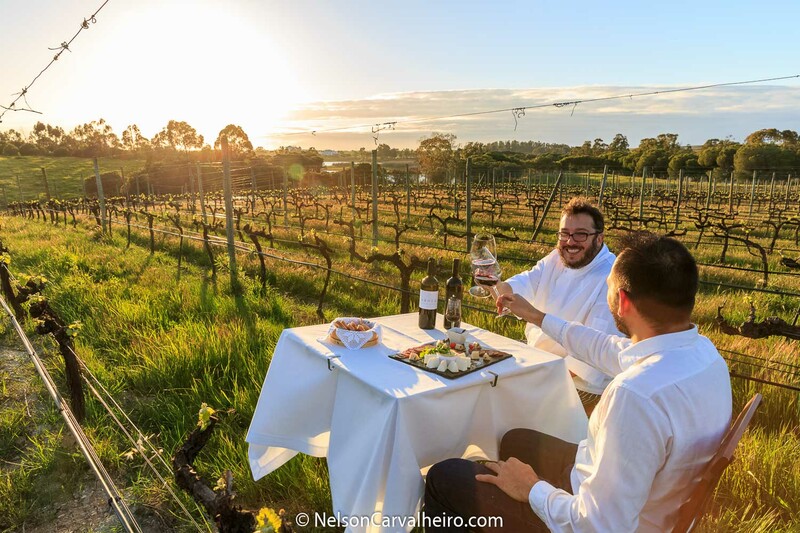 With this in mind, I asked Chef Rui Prado to prepare a little tasting of Alentejo flavours, that we could both enjoy in the middle of the vineyard. Although none of the estates that I have visited in the last days, offers this a bookable experience, I wanted to have it. And as they say, where there is a will, there is a way, and Chef Rui Prado understood me perfectly. 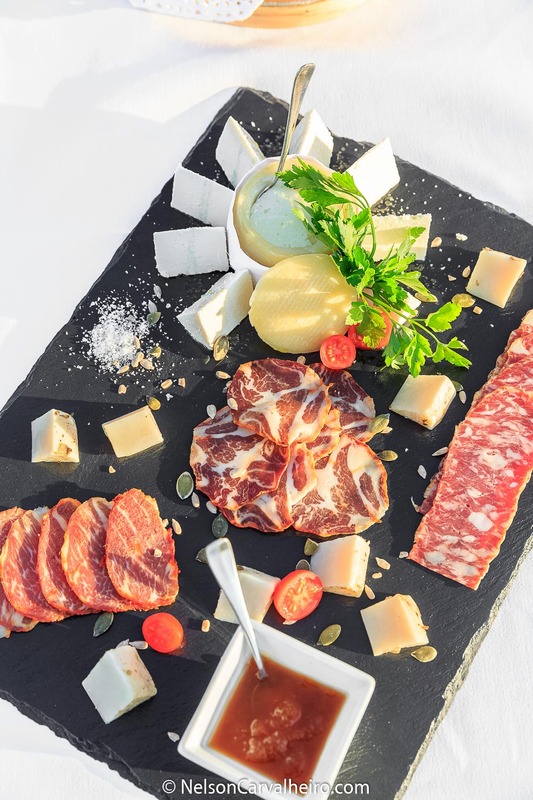 Within 10 minutes a selection of the finest cheeses and charcuterie that he had in his dry store was produced and a table place in the middle of the vineyard. An excellent choice of wine our little soirée: Herdade dos Grous Reserva 2013, a blockbusting reserve red, with 15º. The kind that punches you in the face at the first try, but then leaves you warm on the inside. I was happy, Chef Rui Prado was happy! Together with the meal I shared at L’AND, these were the two highlights of this trip. We then headed out to the Private wine cellar for our dinner together. We tasted the natural and unfussed creations of Chef Rui Prado, even though it was his sous-chef handing all the cooking. What I liked the most were the chargrilled pigs ear and 3day toasted Alentejo bread, sprinkled with rough salt and the estates olive oil. 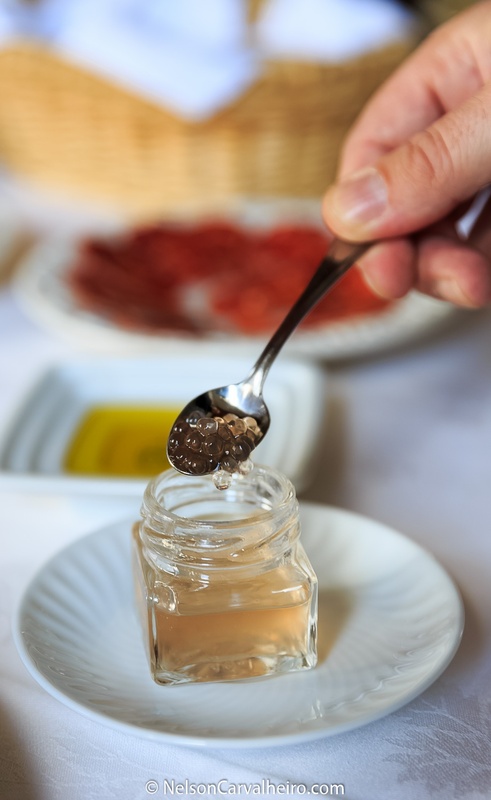 This together with the fact that the he already adds a few drops of olive white wine vinegar to the vegetable soup we have a starter, reinforced the idea that Chef Rui Prado is looking to impress guests in the palate rather than via presentation. 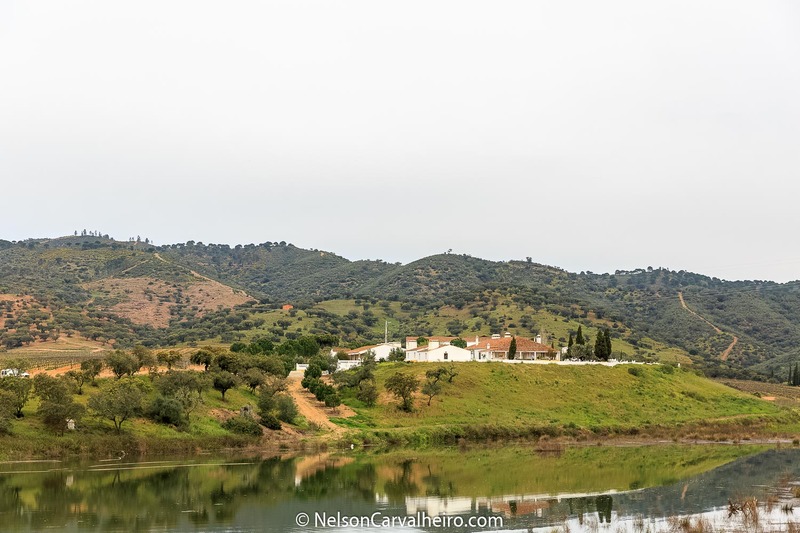 Monte da Ravasqueira’s main buildings are located the heart of a secluded valley in Northern Alentejo, close to the city of Arraiolos. Its white washed and blue lined houses could be the subject of a series of postcards of this region. This is how typical they are. 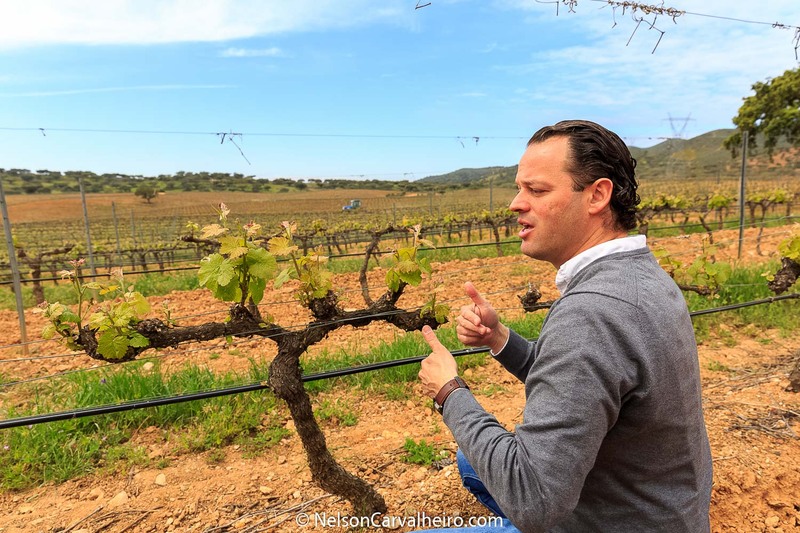 Mario Gonzaga, the Wine Tourism Manager from Monte da Ravasqueira, tell me that the estate has 3000 hectares and it belongs to the José de Mello Family since it was purchased in 1947. 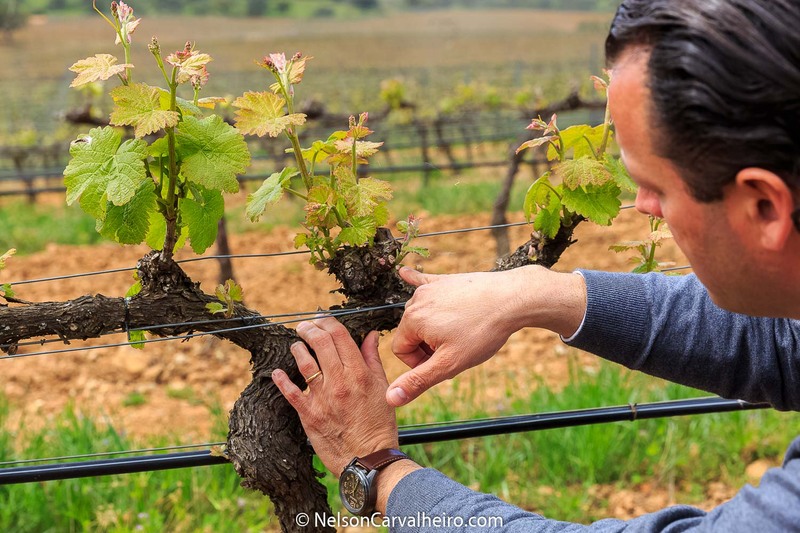 The José de Mello group is one of Portugal’s biggest corporate groups so, but the family’s foray into winemaking is very recent (the first wines were made in 2001). Besides their wines, they have a great cork production, as 45 hectares are of vineyard and the rest if for cork, cattle (they have over 700 cattle heads), Black port, olive oil and honey, although these last two are for the estate’s own consumption. In case you like walking, they also have 12 dams within the estate. I would definitely recommend you to try their olive oil. It is light, fruity and a bit spicy. A surprise for me, as the olive oils from the Alentejo tend to be sweeter. For me the most significant novelty was the wine caviar and wine jelly, made from their greatest achievement, the MR Premium Rosé. This wine is a spectacle and probably my favorite wine from the whole journey. It was only after m first taste that Mario told me that the MR Premium Rosé has been considered for a number of years in a row, the best Portuguese Rosé. A golden collour, very traditional of the rosés originating from Provence. Made from the Portuguese Grape, Touriga Nacional it is savory yet fruity, round and yet fresh. And this is exactly what you taste in the caviar and jelly – minus the alcohol of course. So it would only be suited that I tasted this wine with it’s caviar, a slice of cured sheep Alentejo cheese, black port chorizo and house made Alentejo bread. This my friends, what you see here is the future of Alentejo and in Particular the future of Wine Tourism in Alentejo in a nutshell. The new, modern and international complementing the rooted and centuries traditions of the Alentejo, especially the gastronomical one. Although they say their biggest asset is the vintage carriage museum (a private collection of carriages drawn by horse), I happen to believe that it is the gorgeous gardens and belvedere which belong to the family main house which can prove to be their big Wine Tourist lure. 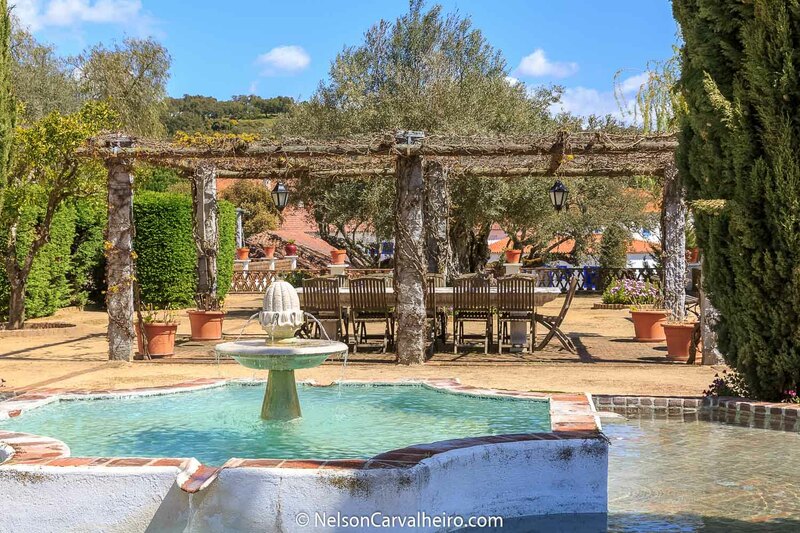 I can also tell you, that from all the other estates that I visited in my 4-day tour of the Alentejo, this was certainly the most romantic spot. 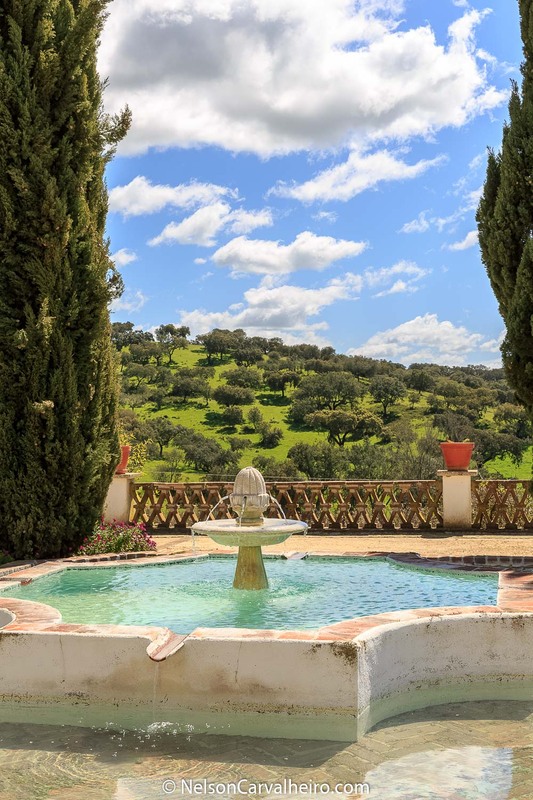 Cypress trees, a Moorish fountain, a belvedere over the vineyards and the soft green hills of the Northern Alentejo landscape in spring. Looking at the long table under the vine array, one can only imagine Sunday family lunches, with a table full of Alentejo delicacies, glassed filled with wine, and children running around. 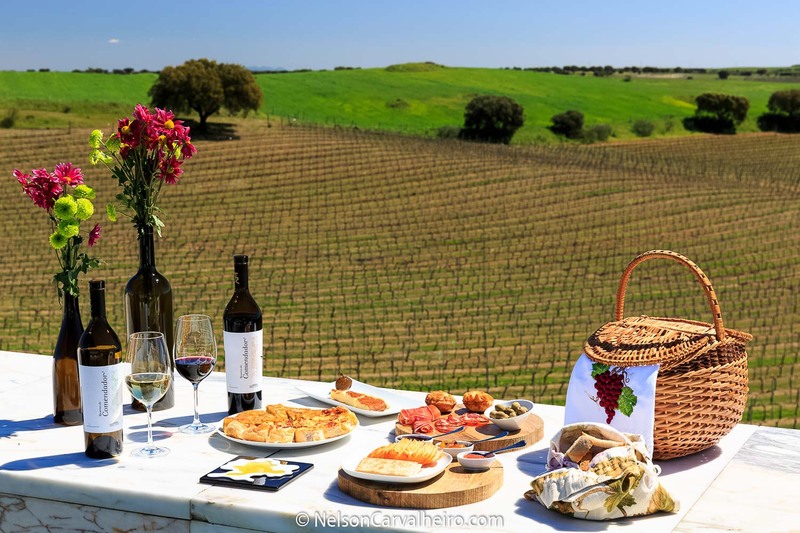 If there is a moment or place that illustrates this idea of Alentejo being the new Tuscany, this is it! Unfortunately, it wasn’t Sunday, and there were no José de Mello Family members around to have lunch with me, so I had to settle for the estate’s lunch room. 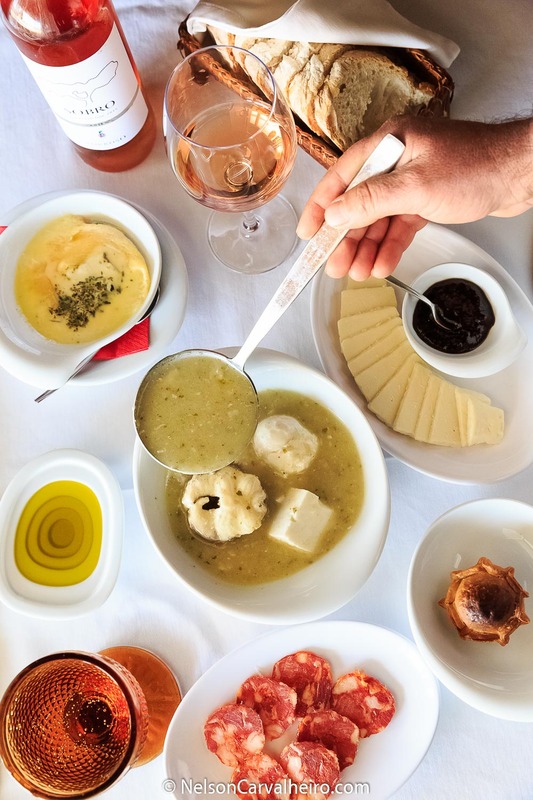 Rivaling local restaurants in its decoration and atmosphere, it is here that the Monte da Ravasqueira can enjoy Northern Alentejo Specialties, cooking by the old ladies which harbor the traditional Alentejo flavors and cuisine knowledge. The best thing about it is that there is nothing fancy about the meal. It is just farm food, made to feed the hungry workers. And although they do not join us at the table (this room is only for the senior staff and the visitors) the rustic flavors are all there. Apart for the first bites I mentioned earlier, we had farm soup packed with cabbage, red beans, carrot, potato, onion, garlic and tomatoes. Even though there was roasted salt cod for main, I honestly recommend that you take two plates full of this soup and save some space for the brulee which comes as dessert. As one would expect, this is caramelized with a hot iron, instead of a blowtorch…Heaven. 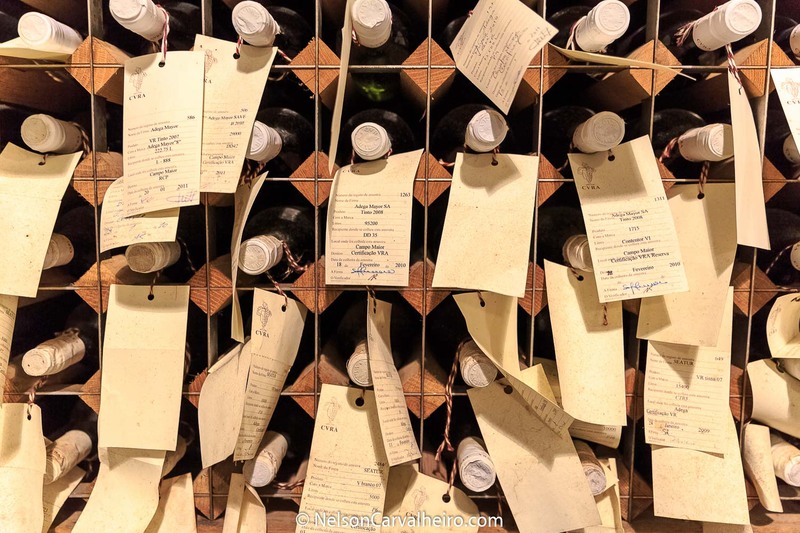 What look for in a Monte da Ravasqueira Wine? 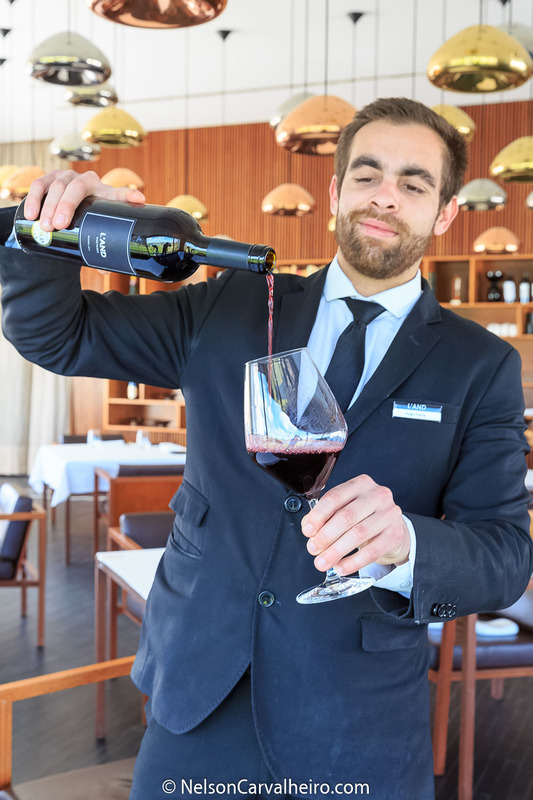 Deputy winemaker Vasco Rosa Santos, the right hand man of Pedro Pereira Gonçalves, who was recently honored as " Young Winemaker of the Year ", showcases a magnum bottle of Monte da Ravasqueira Reserva Reserva red 2013. 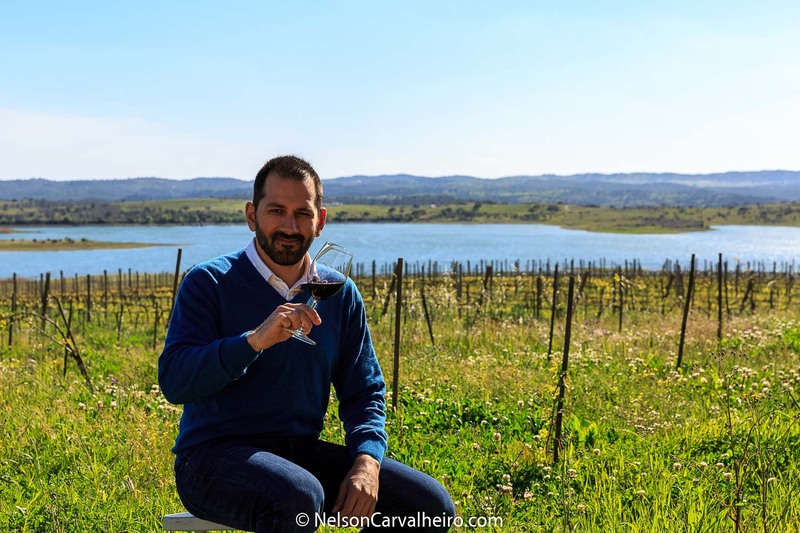 He tells me that this super premium range of Monte da Ravasqueira is the result of a thorough analysis of the vineyard, which resulted in the selection of special blocks of varieties that stood out for its elegance, concentration and character. A wine that joins Touriga Nacional (40%) and Syrah (60%) specially harvested from selected plots by hand to 20kg boxes and kept at 0°C for 24h. Fermented at different temperatures in order to enhance the varietal character, aged separately in new French oak barrels for 12 months. Tasting notes Dense red color and deep violet. Nose of great elegance and complexity with black fruit notes, integrated oak and spicy. In the taste reveals the same profile of elegance with very fine tannins, long and chewable. Chocolate notes and mineral notes marked integrated with notes of oak barrels and earthy, floral and liquorice. As part of its oenotourism project, Monte da Ravasqueira has a large private collection of harnesses and carriages of various eras and styles. 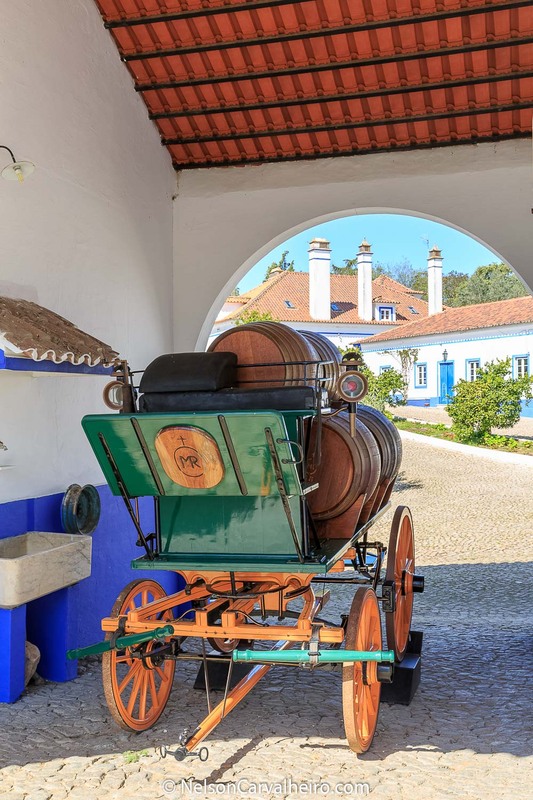 The Carriage Driving Museum is also a way of recalling the fact that the 1996 World Carriage Driving Championship was won by Félix Brasseur, with Falcão, Fogoso, Favorito and Fraque, Lusitanian thoroughbreds from the stud farm that existed for many years on Monte da Ravasqueira. Even if your GPS fails to direct you to Adega Mayor, the scent of coffee roast will let you know that you are in the vicinity of one of Alentejo’s most avant guard wineries. Set up up in the land around the Delta coffee roasting factory in the outskirts of Campo Maior, Adega Mayor is yet another prodigal child of the genius of Rui Nabeiro, Portugal’s most well respected business man. He is widely known for overstaffing his companies and overpaying his employees, just because he has the money and is a serious social welfare advocate. The fact of the matter is that all this compassion can be tasted in the Adega Mayor wines. 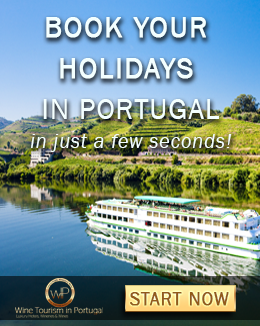 Portuguese Soulful wines from Handpicked grapes almost all originating from autochthonous Alentejo varieties. Set on a 350 hectares area of holm oaks, riparian corridors and agricultural land, the Winery enjoys all the advantages of the Mediterranean ecosystem and is an agricultural area with a strong tradition on vineyards and olive groves cultures. Adega Mayor is an architectural reference worldwide that distinguishes and elevates the wine heritage of the region of Alentejo. It is a unique place in the Portuguese scene, designed by the architect Álvaro Siza Vieira, a tribute to the architecture of wine and life. It can look like a monolith, when one looks at it from the distance, but it is its “squareness” that so majestically contrasts with the overwhelming round shapes that surround it. 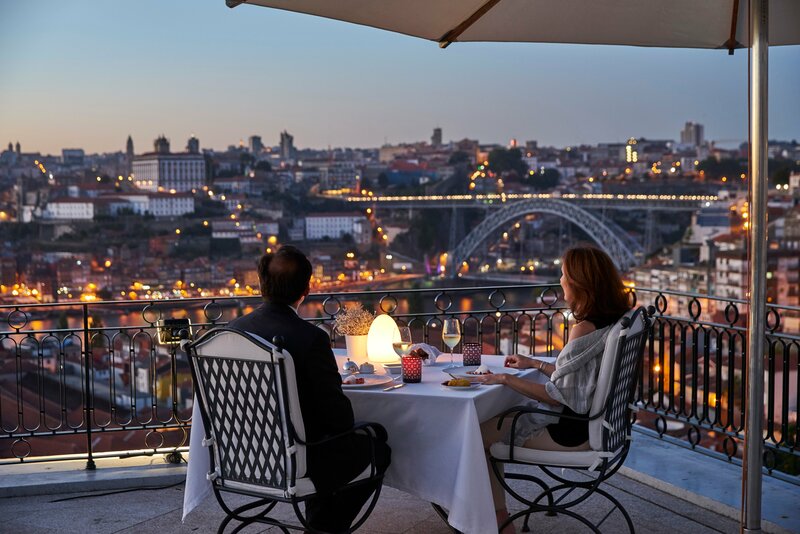 Tiago Correia, the wine tourism manager tells me that the inception for the shape and feel of the Adega Mayor was drawn on a paper napkin, when Rui Nabeiro meet Siza Vieira for lunch and detailed him his wish to build something that would stand out from the Alentejo planes. The union of ideas was bonded from the get go. 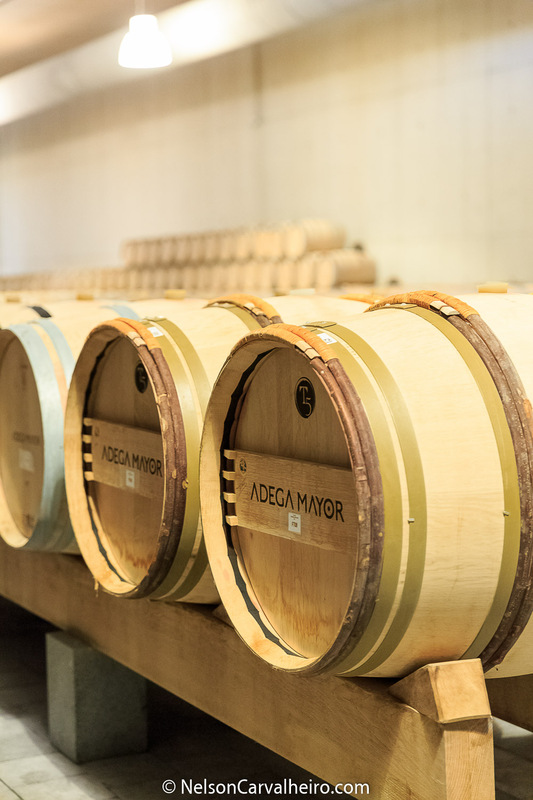 With the freedom and limitless space to build a modern Winery, Adega Mayor is a hymn to modern wine making techniques and winery functionality. Of all the areas, there are two which deserve to be featured. The main hangar of the winery where all the aging process takes place and the terrace, designed in the shape of Mr. Nabeiro’s face. 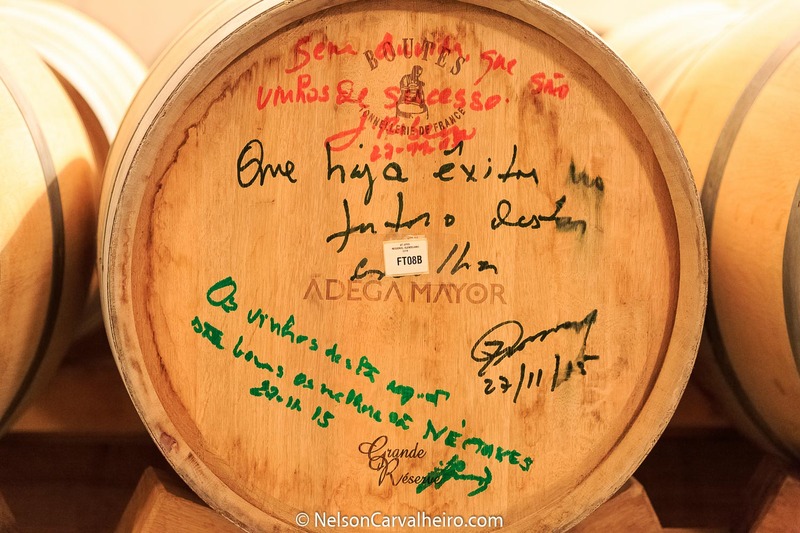 Within the aging hangar, I played around with one of the old 5 liter wine vessels, which the workers took to the fields and tasted the entry level white from the Adega Mayor’s production: The Caiado. Made from Verdelho, Arinto and Antão Vaz it is fresh, crystalline wine with a citrine color and plenty of minerality. A simple and easy wine, made to be drank amongst friends around the pool on a hot summer afternoon. On the “upper deck” I was hosted for an outdoor picnic, filled with northern Alentejo food goodies; mini chicken pies, wild asparagus quiche, an assortment of chorizos hams and cheeses, pumpkin, blueberry and quince jams from the estate’s own fruits, and the Alentejo staples: Alentejo bread and the sericaia dessert. The top of Winery is actually a large terrace covered in grass (the living kind, not the fake one), which a water feature in the middle (not a pool) and some benches along the way. All these features have a both aesthetic and temperature control function for the winery bellow. 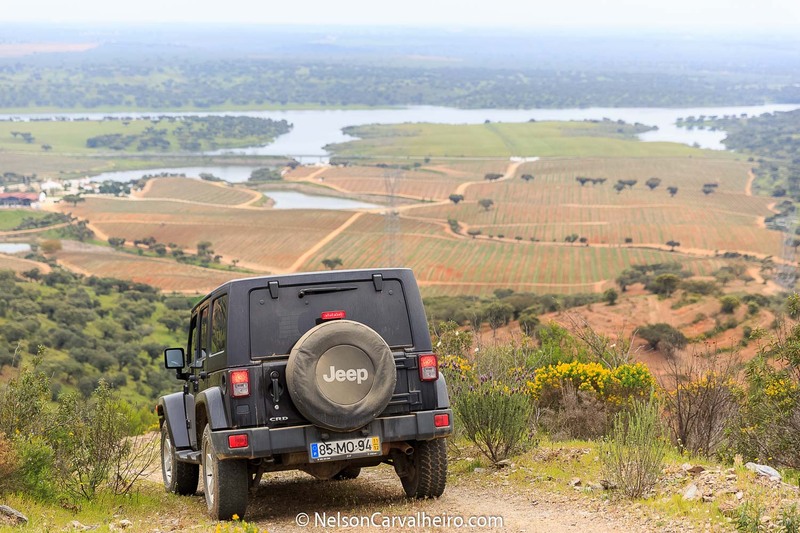 Also, as we are on the top of the highest hill of the estate we can get a comfortable view of the vastness of the Northern Alentejo planes and the horizon that so distinctively brands this region. From here, we can also gaze at the Serra de São Mamede, a small mountain range close to Adega Mayor, which contributes as a temperature buffer and adds to the relative coolness of the Adega Mayor Wines. 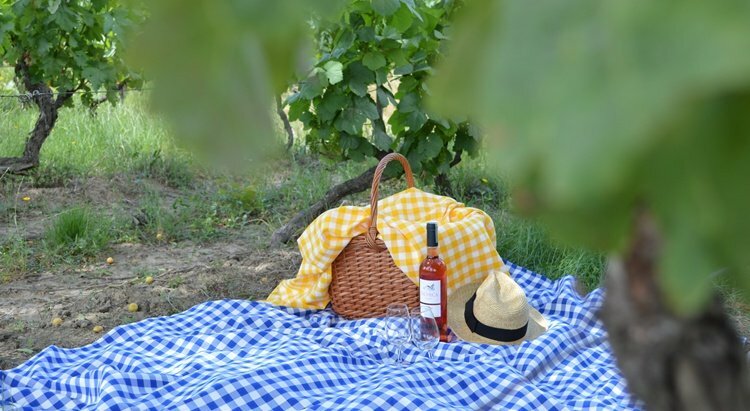 My wine of choice for our picnic was the Reserva do Comendador 2011 made from Alicante Bouschet, Syrah and Touriga Nacional grapes.An elegant and refined companion for large array of strong cheeses and roasted meat dishes. 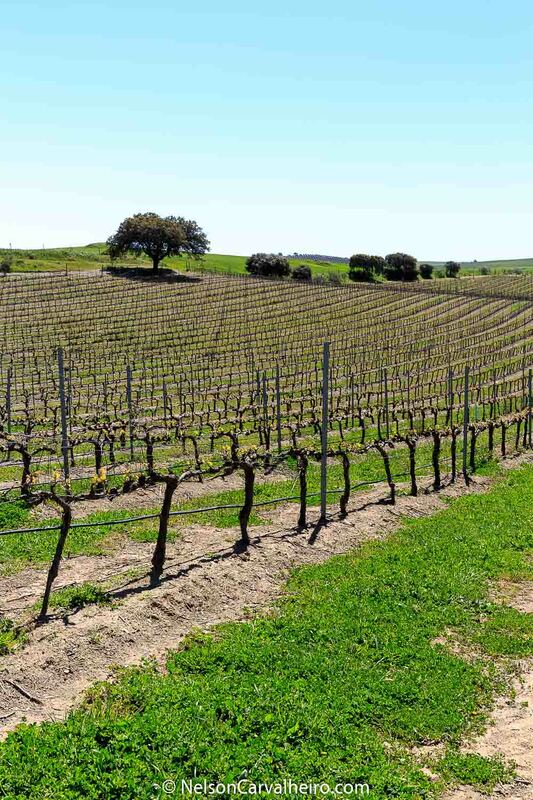 Herdade do Sobroso is made up of a colossal 1600 hectares of lower Alentejo territory. I am saying territory and not land, because within this area, the estate has its own “mountain range”, wild life reserve, lakes, an Iberian pine forest, a part of the Guadiana river and 52 hectares of vineyards. These are all planted next to the river and on the flatter and more accessible parts of the estate. Everything else if pure wilderness. 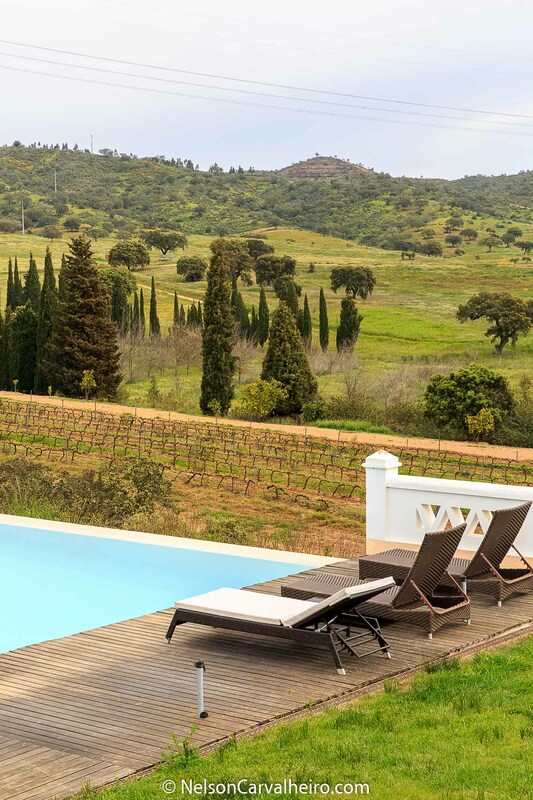 Located in the Vidigueira municipality of Alentejo, Herdade do Sobroso is bordered by the Serra de Mendro to the north, by the River Guadiana to the east and to the south by a vast plain that extends until the eye can see. 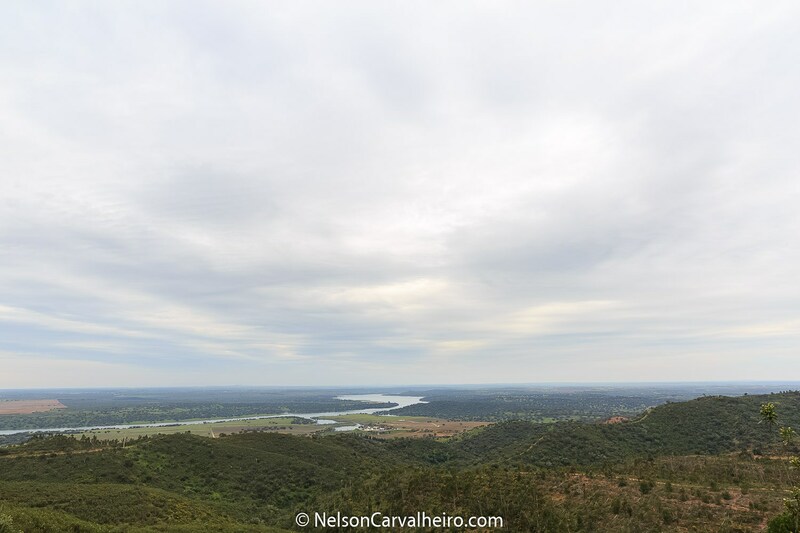 Even though it was a cloudy day when I visited Herdade do Sobroso (April 2016) I could not help myself to be amazed as just how vast this property was and more strikingly that it actually belongs to someone and not the state. A very present reminder of the times when the whole Alentejo was ruled by feudal lords and their mini kingdoms. 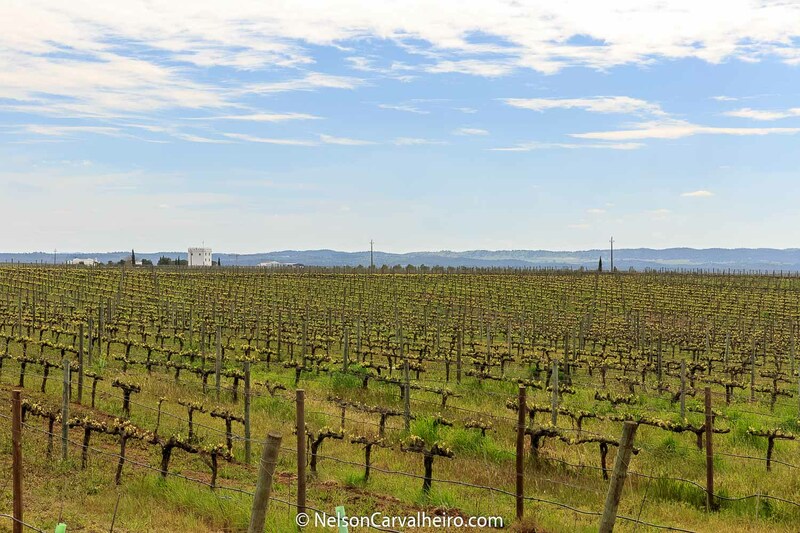 Other examples featured in this guide are the Herdade do Esporão with its 1800 hectares (450 vineyard and 80 olive orchards) and the former extension of the Torre de Palma estate which stretched over 3000 hectares and encompassed several villages. I was taken on a tour of the property by Filipe Teixeira Pinto, the owners son in law and chief winemaker of Herdade do Sobroso. The jeep took about 45min to cross the estate’s small mountain range to ultimately reach its highest point where we could have a 360 view of the property. To the southeast lies the frontier of the property along the shores of the Guadiana River and above those Spain (60km away). On the distant and start south, one can see the city of Beja (45km away). To the north, Herdade do Sobroso still reaches for another 7km. 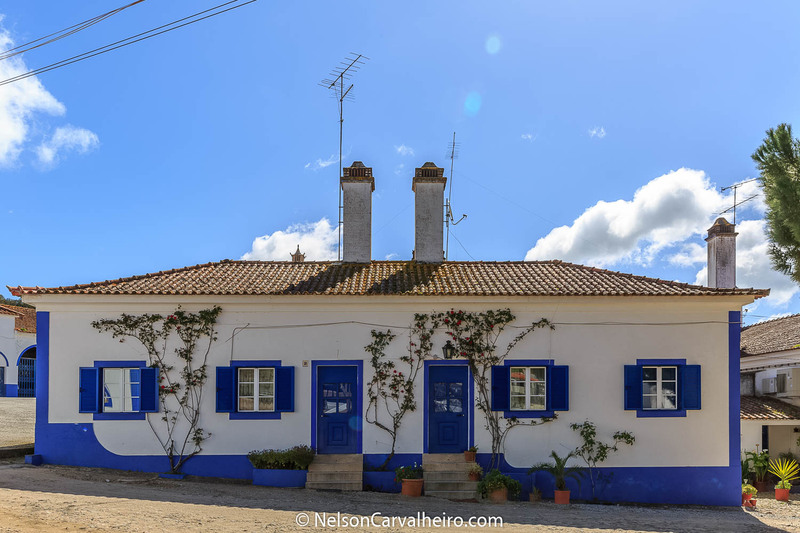 During our almost 2h long Jeep expedition through the property, Filipe goes on to explain to me how his father in law, Mr. António Ginestal Machado, a renowned architect from Porto, bought the property where he could have his own private hunting ground and make his own wine. The purchase happened in 2001 and the first wines were released in 2008 from the harvest made in 2006. In the mean time they also converted the estates old worker’s cottages into a boutique 11 room hotel, all with views to the amazing solitude of the estate’s magnitude. Herdade do Sobroso is known for having an open-clay, sandy soil, which ensures that the design of the vineyards matches the toughest criteria. This guarantees the production of the highest quality grapes. Regarding the climate, this region is known for its cold winters, followed by long, hot summers. The main red grape varieties are Aragonez, Alicante Bouschet, Cabernet Sauvignon, Syrah, Alforcheiro, Tinta Grossa and Trincadeira, while the white wines essentially come from the Antão Vaz, Perrum(both original from Vidigueira) and Arinto grape varieties. Vidigueira as a wine producing region has been mostly connected with the producton of white wines from the Antão Vaz and Perrum grapes. “It was actually a white wine from Vidigueira that became the first ever Portuguese wine to win an international award at the Paris World Exhibition of 1900. “says Filipe. “We want to expand our vineyard area and we are committed doing so only using Portuguese varieties. The market is very thirsty for novelty grapes and Portugal has huge variety to answer this demand. So, I am looking for specialty Portuguese grapes which have a UAU factor and can make the Wines from Herdade do Sobroso stand out from the competition like Touriga Franca and Tinta Miúda. All their red wines (across the whole range) have Alicante Bouschet. A combination of earthly flavors, which reminds me of the land that characterizes the Herdade do Sobro. 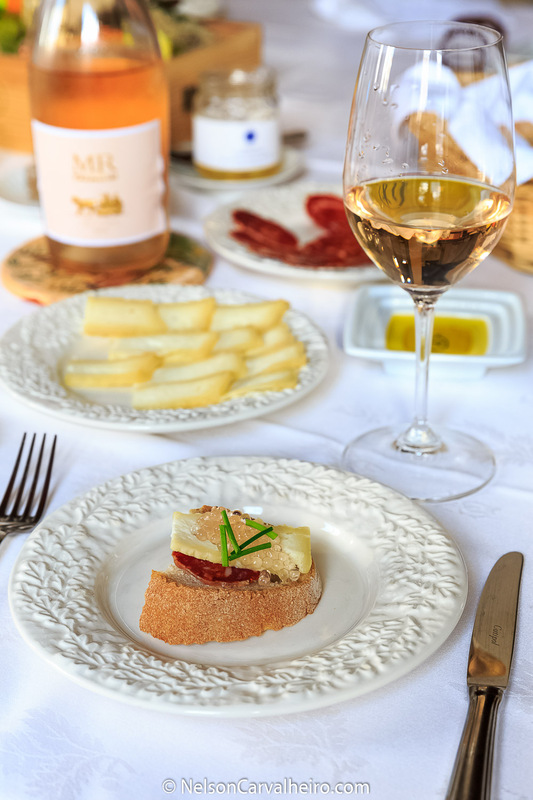 Melted sheep cheese with oreganos went particularly well with the Sobro Rosé 2014 served at lunch. 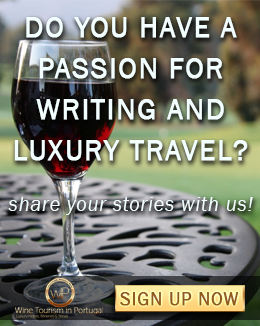 Herdade do Esporão requires no introductions, even to first timers in Portugal Wine Travelling. They are the Portuguese Wine Brand with the most notable recognition overseas, after the immortal (for the good or the bad) Mateus Rosé. Although Portugal is being better represented nowadays, for many years, they are the only Portuguese wine being sold in any world class bodegas in the USA. Together with their olive oil, Esporão was a symbol for Alentejo and Portugal. This dominance over the Portuguese wine representation is clearly visible in their production volume: a whopping 12 million liters per year from almost 500 hectares of planted vineyard. It is this vastness of vineyard that you travel through, as you pass the gate of the estate and make your way into the visitor’s center by the waters of the Alqueva lake. I have to say it is quite impressive to be driving for almost 10 minutes by car and seeing row after row after row of vineyards in every direction. Now the big difference is that if this was Chilli, Argentina, South Africa or Australia, these large production volumes would implicate below par wine, but this is Portugal and Mr. David Baverstock (the Portugese/Australian Chief WineMaker at Herdade do Esporão) does not play around. 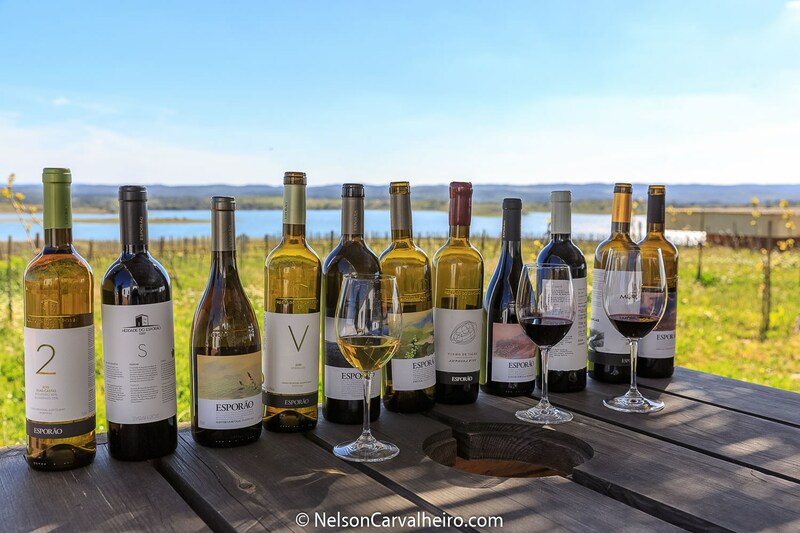 During my visit to Herdade do Esporão, I had the opportunity to try their 5 newest wine from the 2015 harvest which have just been release a couple of weeks ago. I was amazed at the range of high quality that I was presented with. I will highlight the two wines which impressed me the most, the Verdelho 2015 and the Amphora wine 2015. 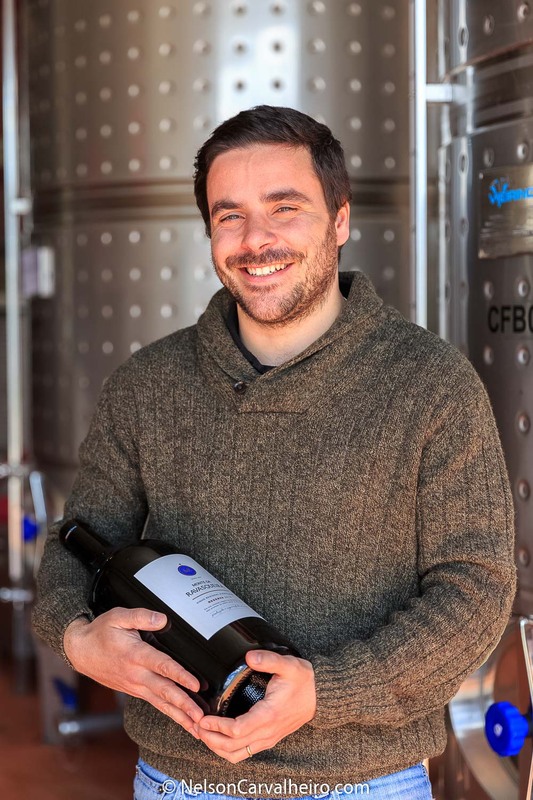 The latter because they have dared to take the 2000-year-old amphora wine making process introduced by the Romans in the Iberian Peninsula, which is still widely used across the whole interior Alentejo and made a red wine which is different from anything you tasted before. Its natural fermentation occurs in in clay pots with resin lining, they have extended skin maceration. It has a deep rustic and smoky taste, almost of leather. It is when you taste an “unmodernized” wine like this, that you realized how the wine made by our ancestors must have tasted like, and just how much more quality wine is produced today thanks to all the technological advances in wine making. The red lacquer bottle top, adds to the drama of opening such an “antique wine”. The Verdelho 2015 is a wine that somehow represents the year of 2015 in the wines made in Herdade do Esporão. As it is a white mono varietal wine, of the year is good, then the Verdelho will reach its full potential and make an extraordinary wine as is the 2015 that I tasted. Fresh, elegant, tight palate with mineral notes and a long finish with cleansing acidity. 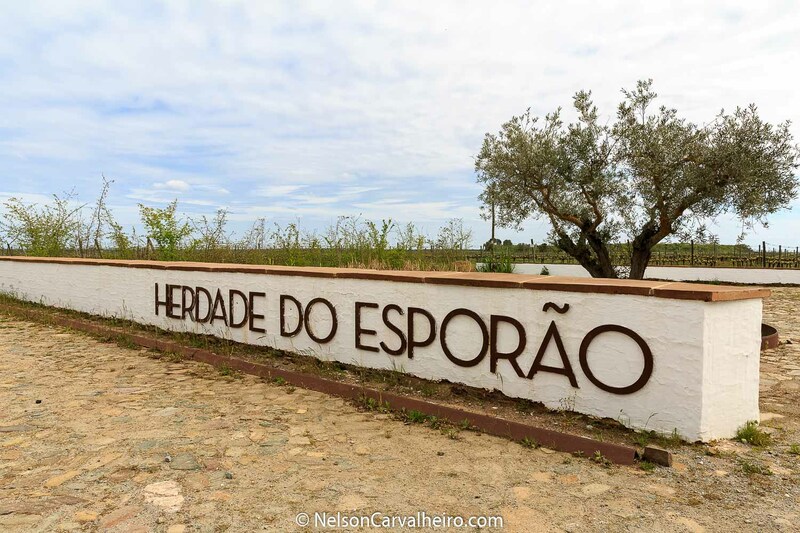 Herdade do Esporão does not produce too much of it, so they are used to emptying its stock half a year after it was put on the market. Maybe the fact that it keeps getting recognized in wine competitions across the world and the 2014 edition having won the Best Portuguese Wine in 2015 competition have helped its cause. Verdelho is a grape variety original from Madeira island which has adapted extremely well to the Alentejo.